﻿Reflections on our MYP2 IDU trip. Our school trips are both entertaining and educational and we really look forward to it every year. Panchgani is a small hill-station three hours away from Pune. The Panchgani trip turned out to be an exceptional trip that cannot compete with any trip we had earlier. This trip was atypical because of the adventure activities, the environment, the commitment exhibited by the Adventure Mantra group and the learning along with the fun we had. It was a 3 night, 4-day trip and we left the school around 8:30 in the morning on the 5th of February. We reached Panchgani and we checked in NatVenture tents. For most of us, the stay in a tent was a maiden experience. After we comfortably checked in to the tents, we went to Natskies, which is India’s first open observatory for Astronomy and Space Science. We did activities like creating a paper rocket and launching it, telescope and a puzzle using sign language. This helped us understand the hardships the astronauts face. The next two days were packed with adventure activities like rappelling, caving, rope bridge, zip-lining and obstacle course. These activities taught us to overcome some of the fears and to be risk-takers. Later we visited the book village where we could glance through the collection of local books. We also visited a local school in Bhilaar which gave us an opportunity to interact with the local students and understand their side of school life and the education system. This was a service activity. We spoke about different countries and the variety of cultures and tradition to those students. In response, they sang a local song for us. The bonfire night added more zing to the tour as we entertained each other by singing and barbecuing. We had fun eating together under the sky in the night. On the 8th of February, we drove down to Mapro Gardens. We learnt how strawberries are planted and harvested. The ice cream with the fresh strawberries kept us finger-licking and lip-smacking. We carried two boxes of fresh strawberries back home for our family. Overall, it was an enriching and entertaining trip with a lot of learning outcomes, new experiences and challenges. 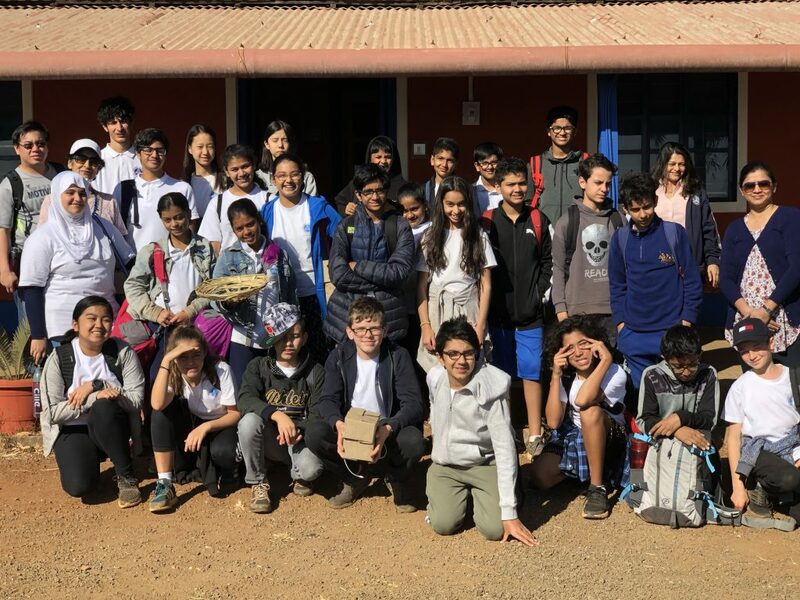 In the MYP2 Field trip we went to Panchgani with Adventure Mantra. 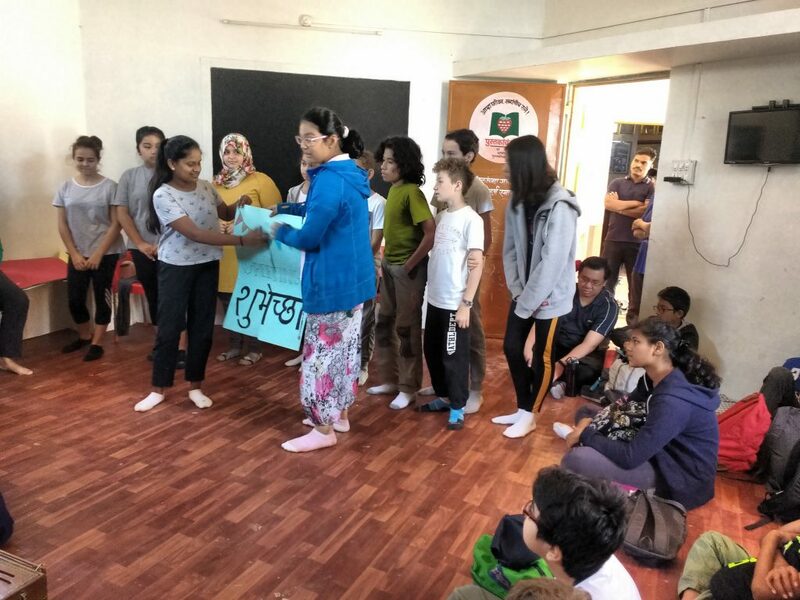 We did fun activities such as rappelling, caving, basket weaving recreating warli art and service learning. When we went on this trip it was like a gate way of challenging yourself to do new activities. For our class one of the gates was related to us being risk takers. Doing Rappelling down a cliff was not a normal adventure for everybody, some were scared some were nervous but we all managed to overcome the nervousness and fright. In service learning we were in groups presenting about our country. Our class took challenges and tried communicating with them in their own language. Our outcome we expected was to share our knowledge with them, for our class to learn from them and to be caring and towards them.. We definitely reached the outcome and achieved more. We experienced collaboration, and communication in a way that we did not do usually so it was a very good learning experience for all of us. In the trip we also did fun teamwork activities related to again collaboration, communication, time management and organisation skills. We went to a Nasa Observatory where we were split in teams of three and were given a mission pack which had challenging tasks to do in a certain amount of time. We made a rocket in 12 minutes as a team where we learnt how to quickly and successfully communicate, collaborate, organise and finishing the project on time. We made a fun puzzle without talking which meant we had to figure out a more complicated way of collaboration. Our whole class used sign language to complete the puzzle and each one of us did. Overall our class thinks that the whole field trip was a great learning experience itself where we overcame challenges and learn skills such as collaboration, communication, teamwork ect in different ways. We had a fun time and would definitely like to revisit the experiences again.